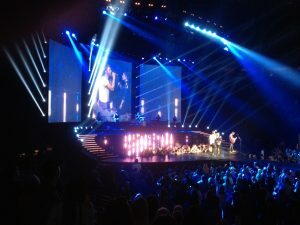 My popular music and lifestyle blog, GeneStout.com, will be officially “introduced” to Seattle Times readers today with a review of country stars Lady Antebellum, Darius Rucker and Thompson Square Tuesday night at KeyArena. Thus begins an exciting freelancing relationship and “news partnership” with the Times after many years of writing for the Seattle Post-Intelligencer and blogging for Seattlepi.com, where many of my past stories are archived online. Braving chilly weather, fans swarmed the Seattle Center grounds for Lady Antebellum’s concert. Indoors at KeyArena, fans showed off their dance moves while LMFAO boomed from the speakers during a pre-show contest for seating upgrades. Hot-selling country headliner Lady Antebellum lived up to the promise of its early hit “Lookin’ for a Good Time” Tuesday night at KeyArena, offering more than three hours of high-energy, hand-clapping music. 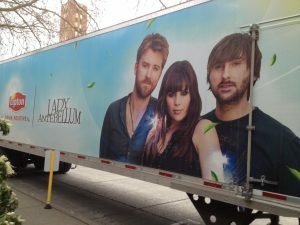 Lady A’s current disc “Own the Night” has been Billboard magazine’s No. 1 country album for 13 weeks. With opening acts Darius Rucker and Thompson Square sharing the stage, it was a big night for young country. To read the entire review on the Seattle Times website, as well as view a gallery of concert photos by Erika Schultz and read the latest news about the group, click here.